Recently, Microsoft released Windows 10 Creators Update (Redstone 2) insider build 14986 with many new features. 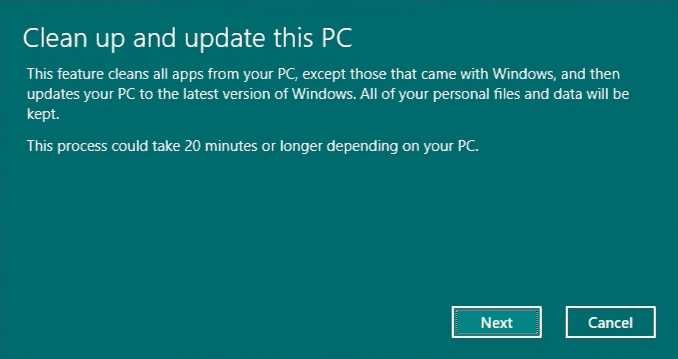 Now, some insiders found a new hidden ‘Clean Up and Update this PC’ tool. This new Windows 10 Creators Update feature cleans all apps from users PC, except those that come with Windows, and then updates PC to the latest version of Windows. Sometimes new unfinished features remain hidden within the operating system and unknown to most. Run by pressing Win + R.
Now type systemreset -cleanpc and press Ok. Confirmed the steps and press Clean to start the process of cleaning and updating.